The avalanche danger is MODERATE in starting zones in the Alpine today. Wind slabs 1 foot in depth with isolated pockets up to 3’ deep could be triggered by riders and skiers on slopes over 35 degrees. The danger is generally LOW at Treeline, where a previously weak snowpack has refrozen on the surface. Avalanches are unlikely in this mid elevation band (1,000-2,500’). Exceptions to this will be in the form of glide avalanches which can be found scattered throughout the forecast area around the 2,500’ level. Avoid glide cracks as they can release at any time without the typical warning signs. Despite it being mid-January, early season conditions exist. Expect to hike to about 1,500' before being on snow. Rocks, stumps, and open water are hazards to contend with in the lower and mid elevations. 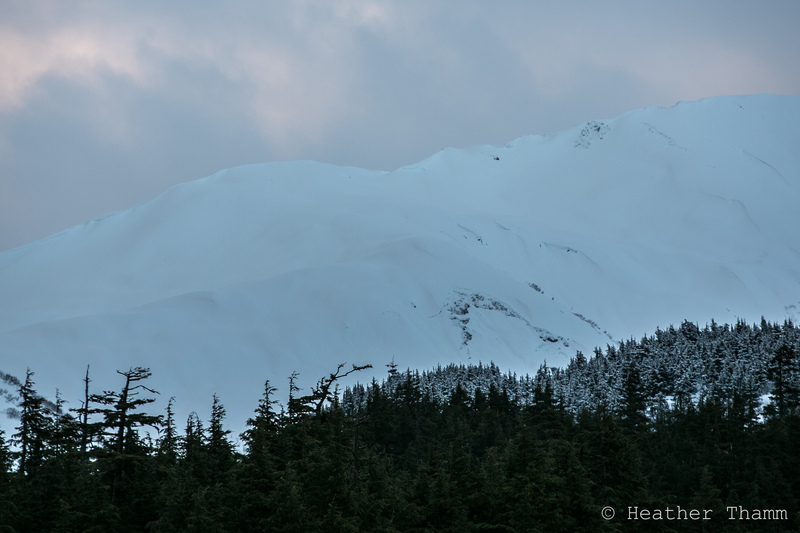 The CNFAIC Avalanche Rescue Workshop schedule for January 18th has been canceled due to lack of snow at the parking lot level in Turnagain Pass. The next hands-on rescue workshop is scheduled for Saturday February 7th. Please check our calendar for up to date info. Yesterday my partner and I watched upper elevation starting zones being actively loaded by moderate winds out of the East. These slabs will mostly be in the 1 foot range today with areas holding deeper pockets up to 3’. Reactivity of these slabs will be on the decline throughout the day. If you find yourself venturing into high elevation starting zones approach with caution. It will take slope angles greater than 35 degrees to get slabs to release. Watch for shooting cracks and check under the surface to see how well the new snow is bonding. Glide cracks have been opening up over the past 2 weeks around the forecast area on all aspects. Most of the activity is in the mid elevations, around 2,500’. We were able to see some newer cracks yesterday that had formed during this past week. Glide avalanches are unpredictable and require avoidance, as they can release at anytime. Glide avalanches don’t behave the same as new snow instabilities like wind slabs. Simply knowing where glide cracks exist is half the battle. Check the observations page for more info. Photo: Glide crack that opened up sometime in the past week on Tincan, below Common Bowl. Temperatures over the past 24 hours have cooled with freezing levels hovering around the 1,000-1,500’ level this morning. Showery precipitation brought 1” of new snow above 1,500’ and rain below. Winds have slowed down overnight with ridgetop stations reporting speeds in the 5-10 mph range this morning out of the East. Today expect cloudy skies with light precipitation. Snow accumulation will be minimal with 1-2” expected. Rain/snow line will be around the 1,000’-1,500’ level. Winds will be in the 5-10 mph range out of the East/Southeast. Temps at 1,000 will climb into the mid 30s before cooling back down again overnight. The general pattern will remain unsettled through the long weekend. Expect rain and snow showers, light winds and temperatures to remain mild. *Seattle wind data is 6 am-12am due to station malfunction.